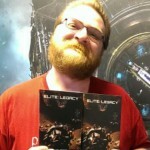 Elite Dangerous, Elite Legacy, Official Fiction, Science Fiction, Writing. Bookmark. Lave Radio Episode 51 – Warning Temporal Anomaly Detected! Wow, nice stereo here! Is this a binaural recording? Sounds like it (on headphones). I’ve been wishing for podcasts to start using that sort of method, so that the different speakers’ voices sound as if they come from distinct positions around me. I was using the Zoom H1 portable recorder for this, so yes, each participant was opposite a different pick-up device in the room. Glad you liked it!